Chief Complaint: 36-year-old male referred from Otolaryngology for a sunken left orbit. History of Present Illness: A 36-year-old male was referred by his otolaryngologist to our oculoplastics clinic for evaluation of a sunken left orbit. This was noted while he was being evaluated for trouble breathing a few months prior. He has no complaints and has noticed no changes with his left eye. 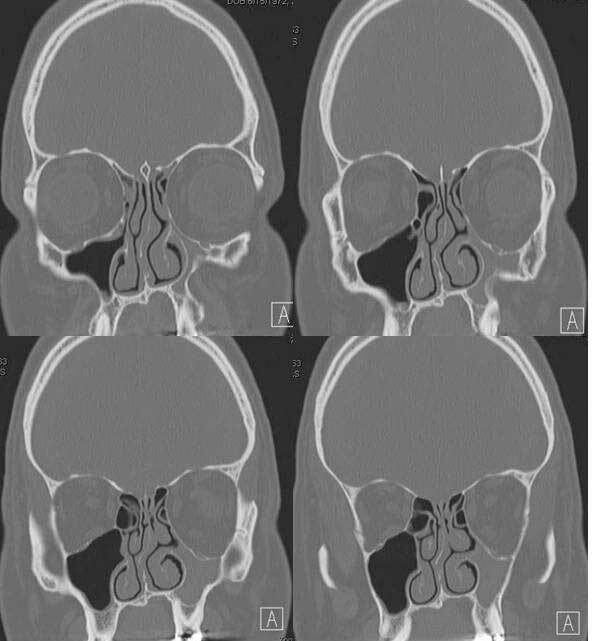 Figure 3: Coronal CTs of the parasinuses demonstrate completely opacified and atelectatic maxillary sinus with inward bowing of all of the left maxillary sinus walls; increased left orbital volume with enophthalmos; lateralized left uncinate process which apposes to the inferomedial orbital wall; deviated nasal septum; mild mucosal thickening of multiple ethmoid air cells bilaterally; enlarged middle meatus with lateral retraction of the middle turbinate. This patient initially presented to an otolaryngologist due to his worsening nasal obstruction even on CPAP and was thought to have sinus disease. 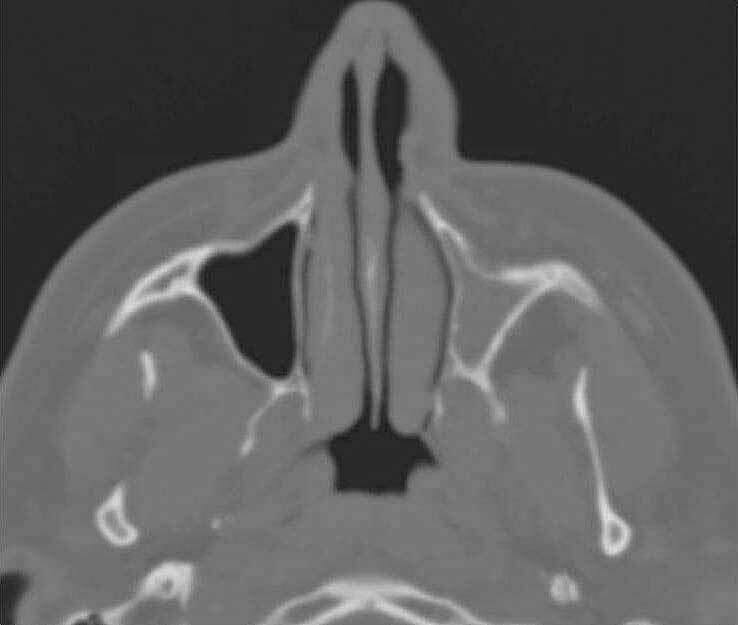 A CT scan was performed and showed an opacified maxillary sinus with inward bowing of the bones of the maxilla, consistent with the diagnosis of silent sinus syndrome. The etiology and the pathophysiology of silent sinus syndrome is not clear but according to the available literature, the inciting cause is thought to be due to the hypoventilation of the maxillary sinus due to the obstruction of the osteomeatal complex. The hypoventilation over time results in resorption of gases into the capillaries of the sinus cavity, creating a negative pressure. Consequently, secretions accumulate which leads to chronic subclinical inflammation and atelectasis of the maxillary sinus. Biopsies, which may be performed to rule out malignancy if the suspicion is high, demonstrate respiratory epithelium with minimal lymphoplasmocytic infiltration and fibrosis. Bony fragments may show increased remodeling. The differential diagnosis of enophthalmos is considerable (see below); however, it is imperative to rule out trauma-related orbital fractures in this young/middle aged population through extensive history taking as well as the physical exam and imaging. According to the patient, he experienced no ophthalmologic complaints and was unable to recollect when these signs began. Analysis of all published cases thus far demonstrates that the mean duration of symptoms prior to presentation was 6.52 months. The goal of treatment is to open the maxillary ostium with a wide enough antrostomy to prevent potential reobstruction. Orbital floor reconstruction can be done concurrently. Orbital floor reconstruction alone is not adequate and will not prevent recurrent enophthalmos in silent sinus syndrome. Hong ES, Allen RC. Silent Sinus Syndrome: 36-year-old male with sunken left orbit (Enophthalmos). EyeRounds.org. January 4, 2010; Available from: http://www.EyeRounds.org/cases/102-Enophthalmos-Silent-Sinus-Syn.htm.